Swiss marathon specialists, Urs Huber (Team Bulls) and Ariane Kleinhans (Team RE:CM) shattered the men and women’s course records respectively when they claimed dominant victories at the 2014 Fairview Attakwas Extreme mountain bike marathon near Oudtshoorn, South Africa on Saturday. Huber, a 28-year-old former Swiss national champion, clocked a time of 04 hours 47 minutes 46 seconds, almost nine minutes faster than the previous record of 04:56:29 set in 2013 by compatriot, Christoph Sauser (Specialized Racing). It was Huber’s first attempt at the 121km event, which includes a demanding 2 900 metres of vertical ascent. Sauser, the current marathon World Champion, was runner up on Saturday in a time of 04:54:33, also eclipsing his previous best time, but still well behind the rampant Huber, who rose to global prominence when he finished runner-up in the 2013 ABSA Cape Epic stage race with German teammate, Karl Platt. Platt finished third on Saturday in a time of 04:55:16, with Czech Republic’s Frantisek Rabon (Specialized Racing) securing fourth in his first race as a mountain bike pro following a decade-long career as a road cycling pro. Erik Kleinhans (Team RE:CM) was the first South African finisher in fifth place. “I must say I was surprised to win by such a big margin. Being the first race of the year I didn’t know what my condition was like and I’m still in training, so I didn’t peak especially for this race,” said Huber. 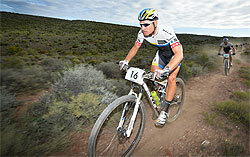 “This Attakwas race was a very good allround test. The first half was very rough and technical. I couldn’t ride up some of the climbs. Not many of us could. The second half was more rolling, but still long and tough,” added Huber. Huber took the lead by riding away from defending champion, Sauser, with 70 kilometres remaining while climbing through the Attakwaskloof Pass, a rugged, scenic 300-year-old ox-wagon pass through the Outeniqua Mountains. Current Swiss marathon champion, Ariane Kleinhans (Team RE:CM), who lives in South Africa, captured her fourth successive Attakwas Extreme title in 05:40:38, slicing almost two minutes off her previous best mark of 05:41:29. She placed 22nd overall in the 1000-plus strong field. South African marathon champion, Robyn de Groot (Biogen Toyota) outsprinted Ischen Stopforth (Sasol Racing) after almost six hours of racing to claim second place in her first attempt at the event. Stopforth became the first woman to finish eight editions of the race. “I’m very pleased to win again. It was a good winning margin, but it’s never an easy race this. I was hoping for a fast time and I pushed it really hard in the final 50km, a lot of the time there I was on my own,” said Kleinhans. “Early on it was just Robyn (De Groot) and I in the lead and in a rough section I got away from her because she is not so good in the technical stuff. Then I tore a tyre sidewall and managed to nurse it to the first tech zone where I got another wheel. I managed to catch Robyn again before the King of the Mountain at about 55km and then I just focussed on staying smooth and trouble-free to the finish,” added Kleinhans. Of the celebrities that tackled the event as part of their preparation for the ABSA Cape Epic in March, former Springbok rugby players, Joel Stransky (06:46:33) and Stefan Terblanche (6:46:37) finished in 130th and 133rd respectively; while TV and radio presenter, Lizel van der Westhuizen (09:49:18) was 726th and actress, Hlubi Mboya (10:05:10) was 758th. The Cape fox is the only true fox in Southern Africa.